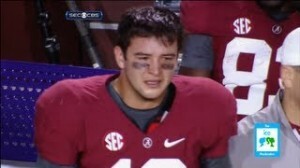 There was a lot of things you can say about AJ McCarron after Alabama's victory against LSU Saturday. You could say that he struggled in the second half of this game. You could say he isn't a Heisman candidate any more after his performance Saturday, but I prefer to call him a winner. Most college football experts were extremely impressed that AJ was able to bounce back in the end to lead his team to victory. Even more college football fans were impressed at the emotion and heart that were shown afterwards. "It was just truly a blessing and none of this would be possible without my teammates," McCarron said after the Tide's victory. In a story by the Examiner, McCarron is praised for being what's best about college football. Check out the link below. This is exactly what Bear Bryant meant when asked if he was disappointed that he had no Heisman Trophy winners while head coach and he answered “We have no individual Heisman Trophy Winners, but we have championship teams.” This is , and always has been, the essence of Alabama football, team play, and this is the reason McCarron and his teammates are champions.